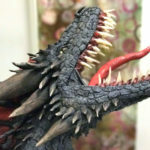 Florida CraftArt presents Creatures Wild and Wooly, a national juried exhibition showcasing original art based on creatures—wild, exotic, domestic, imaginary and mythical. More than 35 artists from Florida, California and Chicago created pieces from ferocious dragon heads to wistful, wide-eyed ceramic rabbits and intricately beaded statement necklaces. 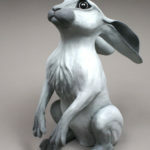 Across the gallery is the “Moon Gazing Hare,” a 19-inch-high ceramic sculpture by North Palm Beach artist and Palm Beach State College Gallery Director Karla Walter. “In numerous traditions, hares are symbols of women, femininity, female deities and women’s magic,” she says. “As a woman and an artist, I personally connect to the cunning and innocent hare.” In addition to the hare, Ms. Walter is exhibiting a 20-inch high ceramic and bronze sculpture of a vulture whose head is adorned with Swarovski crystals, as well as a black crow holding a red berry in its beak. The exhibitions entry is framed by a magical portal arch, entitled “Fiber Forest,” that was created by Roseline Young and Marci Mills, and other fiber artists from the Ft. Myers, Cape Coral area. The opening reception and awards ceremony is Friday, June 30 from 5:30 to 7:30 p.m. at Florida CraftArt located at 501 Central Avenue in St. Petersburg, Florida. The exhibit will run through August 12 with a closing reception, People’s Choice Awards and special appearances by Southeastern Guide Dogs. Other events during the exhibition are rock-painting workshops and a writing class and dramatic readings with Keep St. Pete Lit. ArtLoft artists Sue Hess, Rebecca Skelton and Lee West are painting a large guide dog sculpture, “Muse, the Artists’ Guide Dog,” which will be at Florida CraftArt’s entrance, and then compete in the Superheroes guide dogs fundraising contest. 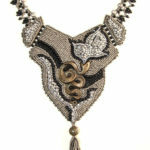 For more information, visit www.FloridaCraftArt.org or call (727) 821-7391. The gallery and exhibition admission is free. Hours are Monday through Saturday, 10 a.m. to 5:30 p.m. and Sunday from noon to 5 p.m.
Florida CraftArt is a nonprofit organization founded in 1951 and headquartered in St. Petersburg. Its mission is to grow the statewide creative economy by engaging the community and advancing Florida’s fine craft artists and their work. Fine craft art is presented in the 2,500-square-foot retail gallery and a large gallery features curated exhibitions. ArtLofts is on the second floor and features 19 working artists’ studios. Florida CraftArt is the only statewide organization offering artists a platform to show and sell their work. work based on creatures-wild, exotic, domesticated, imaginary and mythical. This exhibition is dedicated to the late sculptor Paul Eppling who created amazing wild creatures. Friday, June 30, 5:30-7:30 p.m. Meet the artists at the opening and awards reception. Docent Tours: Wednesdays at 1:15 p.m. Group tours by appointment. July 8, 22, 29 (1:30 to 3 p.m.): Learn to paint creatures on rocks (materials are provided): $5. Space is limited. Register on FloridaCraftArt.org or call (727) 821-7391. Sat., July 15, 1 to 3 p.m. Writing class inspired by the exhibition with Keep St. Pete Lit $10. Writing from the class to be performed on Sat., August 5. Register on KeepStPeteLit.org. Sat., August 5, 5:30 p.m. Keep St. Pete Lit’s Ekphrastic where 12 visual art pieces are interpreted by a dozen local writers, presented in dramatic readings. Sat., August 12, 5:30-7:30 p.m. Closing reception and People’s Choice Award presentation. Meet Southeastern Guide Dogs and the Superheroes making an impact on our community. 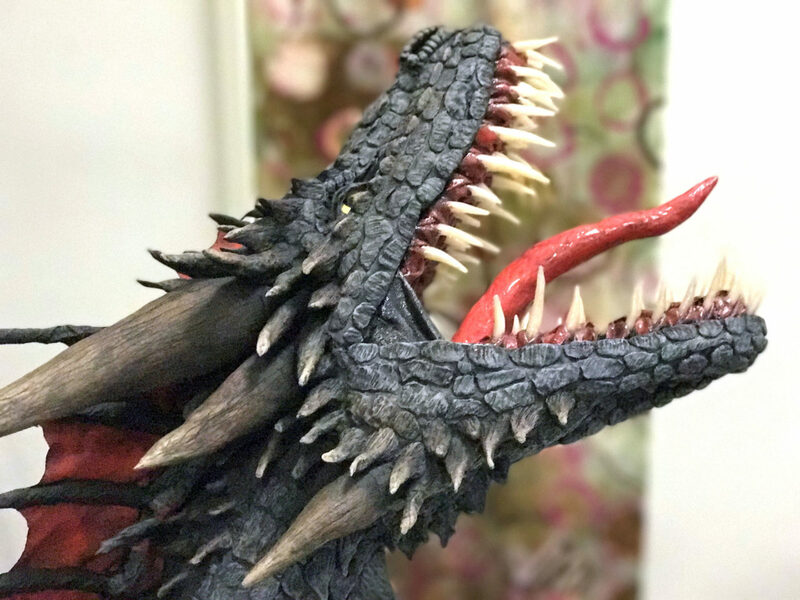 Second Saturday ArtWalk – open until 9 p.m.
“Black Dragon Trophy” by Raymond Bennett, from Riverview, Florida, is 16” x 14” x 18” and is sculpted with papier mâché and mixed media. 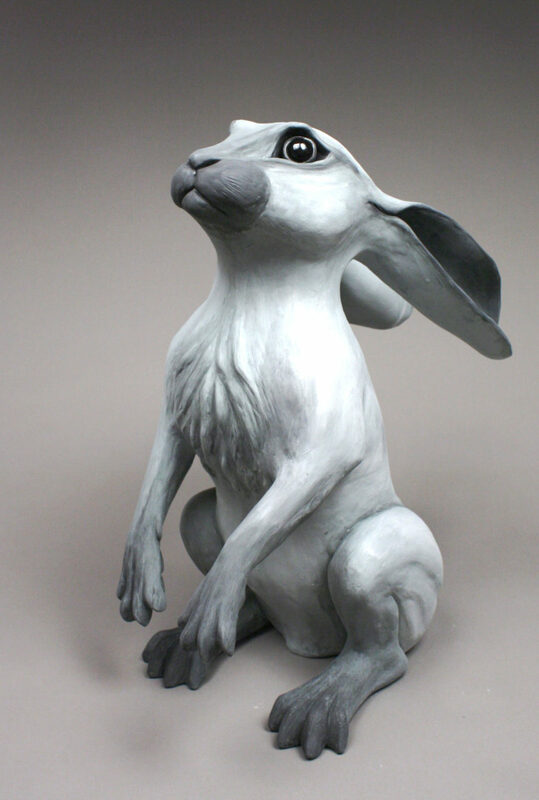 “Moon Gazing Hare,” a 19-inch-high ceramic sculpture by North Palm Beach artist and Palm Beach State College Gallery Director Karla Walter. 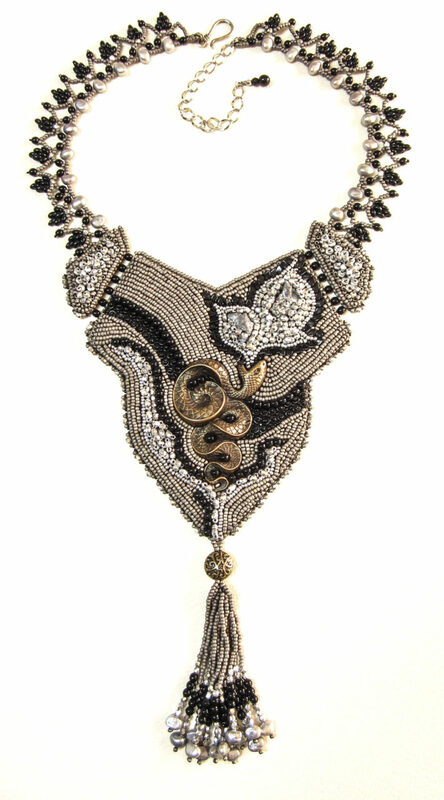 “Serpent Fire” is a glass, pyrite and brass beaded necklace by Jamie Cloud Eakin from Modesto, California.